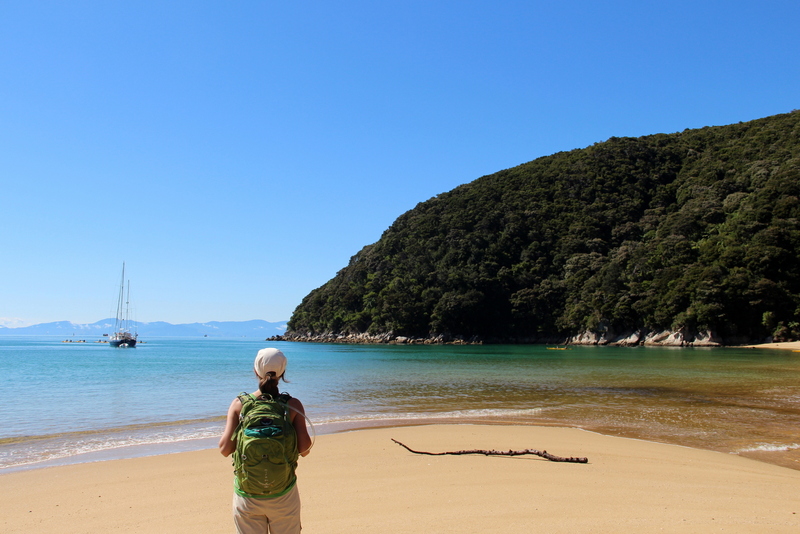 The Abel Tasman Track is a one way hike, so it requires pre-booking a way in and a way out of the park, via some combination of shuttles and water taxis. Apart from those planning their trip long in advance and willing to shell out, most hikers stay in the Department of Conservation (DOC) campsites, which also requires to be booked in advance, especially during peak season. We had made reservations at the Anchorage (which we would now forego) and Onetahuti campsites, and rented a tent and other gear at a store called Rollos in downtown Nelson. 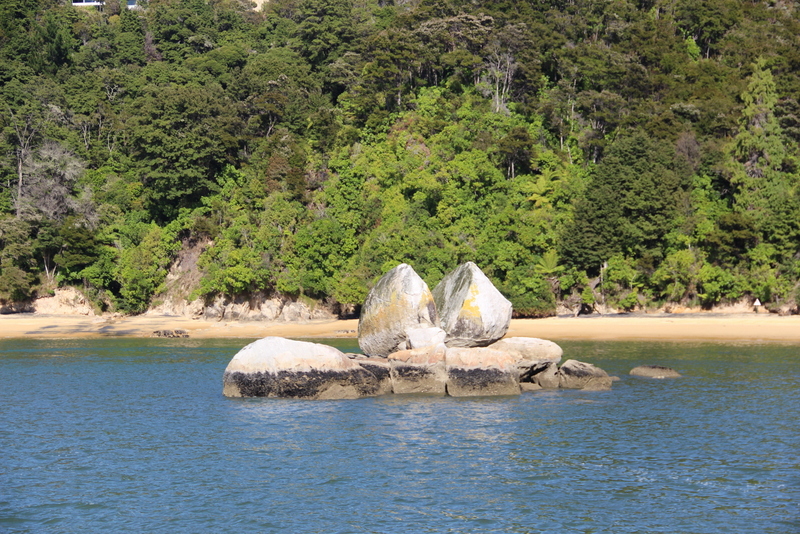 First thing in the morning, we took a bus to Kaiteriteri, and from there, a water taxi to Anchorage with Abel Tasman Seashuttle. The sun was shining, though it was rather chilly, and the views, as we cruised parallel to the coast through curious rocks and seal colonies, were stunning. Soon, we were on land and underway. 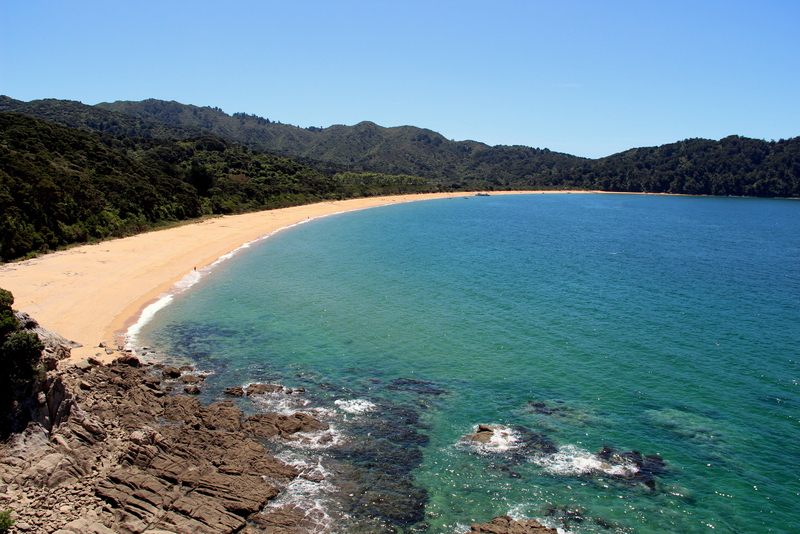 The first leg of the hike was a textbook introduction to Abel Tasman: golden sand beaches, calmed turquoise sea, lush forest and river crossings. We took a break at Bark Bay to eat lunch and enjoy the gorgeous beach, though unfortunately the water was too cold to swim despite it being austral summer. This might have worked out in our favor though, because every part of our body that was exposed was bitten by sand flies, a danger we had read about but distractedly ignored in that first stop… a mistake we wouldn’t repeat. The second leg of the day was equally beautiful, if a bit more tiring. 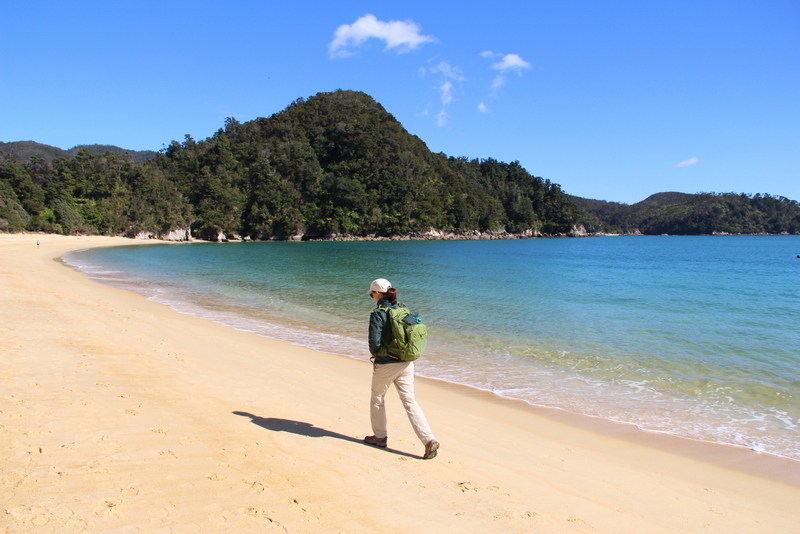 We reached Tonga Quarry and were relieved to find our big backpack with all the camping gear waiting for us on the small beach, a service we had arranged the day before with the water taxi operator. I couldn’t recommend this more highly, not carrying weight allowed us to fully enjoy the hike and not be too picky about the rentals (usually not the most high-tech or lightest gear). 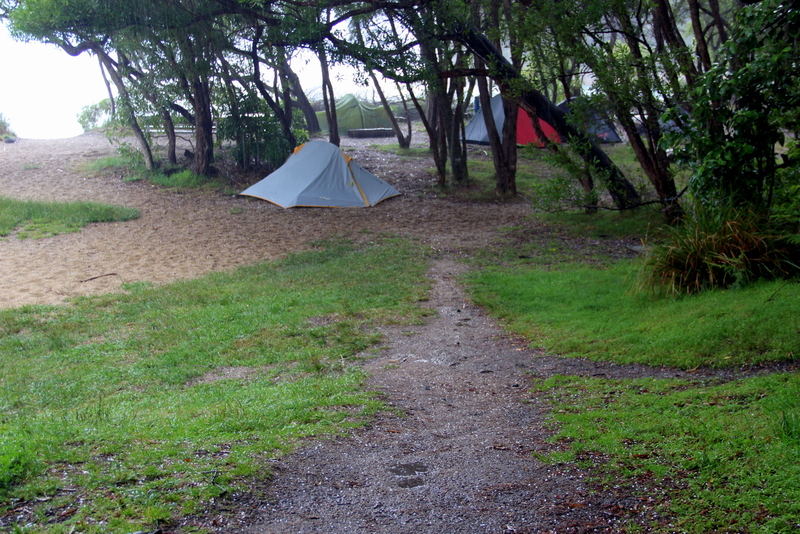 A short walk further, we reached the Onetahuti Bay campsite right when it was starting to pour. We took shelter in the kitchen hut for a couple hours until the rain subsided, and then set up our tent as quickly as possible. As soon as we finished, we realized it was hailing! The weather in NZ is crazy. We got some boiling water from a fellow camper (we had sheepishly opted for not renting a stove, since we only needed it this one time), and enjoyed the most delicious dried food dinner ever. After a rainy night, Onetahuti Bay was a picture-perfect place to wake up. We took it in for a while before walking back to drop off our big backpack, and then continued forward. After a couple hours, we reached Awaroa, a breathtaking inlet that made us reminisce of Australia’s Whitehaven Beach. We had timed the hike to get there at low tide, based on the DOC’s tide tables. Overall, we found the website and map for the DOC to be very helpful and accurate for trail descriptions, distances and walking times. We took our boots off and crossed the freezing waters. 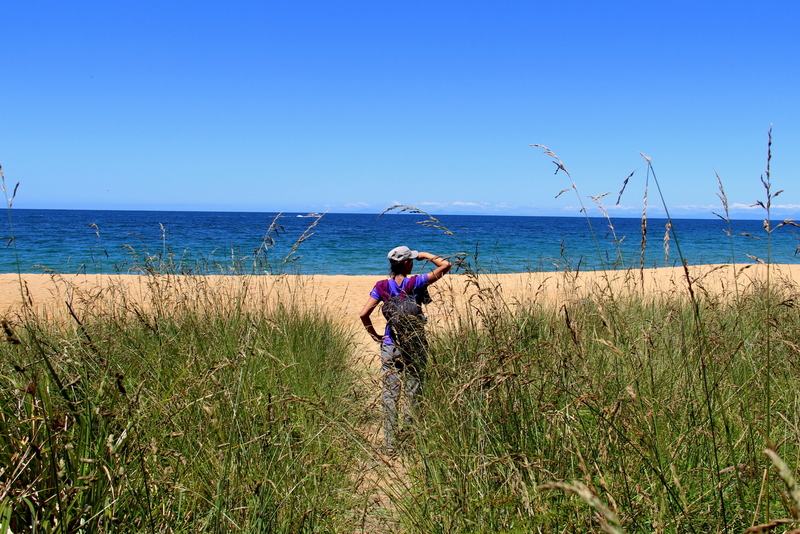 The final stretch of the hike offered more beaches and lush coastline, all the way to the orange crescent moon beach of Totaranui. Shortly before reaching it, we took a quick detour to a lookout point that might have had my favorite view of the whole trail. Down at the beach, we ate lunch and relaxed, until we were picked up by the water taxi. Riding back to Kaiteriteri, it was cool to see the same places we had hiked from a different perspective. We picked up our big backpack at the operator’s office, surprised one more time that it had made it safe and sound, and found the shuttle that would take us back to civilization. 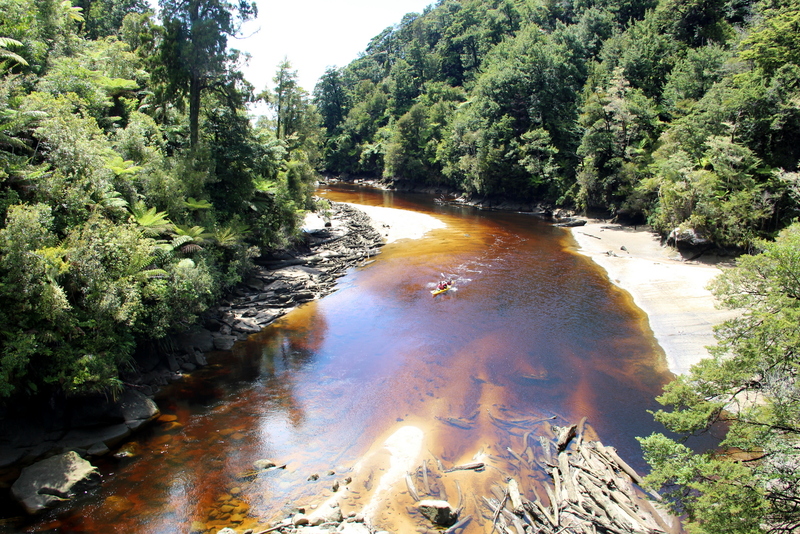 PS: Kiwis call hiking “tramping”, how adorable is that!